Blog from Puno, Peru | Where is the Love? From La Paz we made our way west to Lago or Lake Titicaca, the largest high altitude lake in the world, which splits the border of Bolivia and Peru. The bus journey from La Paz was smooth with Peru's investment in their road network, unlike Bolivia's, including tarmac. At one point we did have to cross the Lake and as the passengers took a small boat the bus was shipped across on a precarious looking wooden raft. Slight concern for our rucksacks at one point but thankfully the lama hats were safe. We crossed the Bolivian border into Peru at Copacabana and headed on to Puno, the main port of the lake on the Peru side of the border. There was not much to see in Puno and the principal reason for the stop here was to venture on to Lake Titicaca itself and explore some of the inhabited islands; the highlight being a home stay with a local family. We spent the evening in Puno at the local market buying gifts for the family we would stay with the following night.The gifts consisted of rice, cheese, milk, oranges, apples, some Panatone as it was approaching Christmas and some jotters and colouring pencils for the children. In the morning after a rickshaw transfer from our hotel to the port we boarded our boat and set sail for our first stop at the island of Taquile. 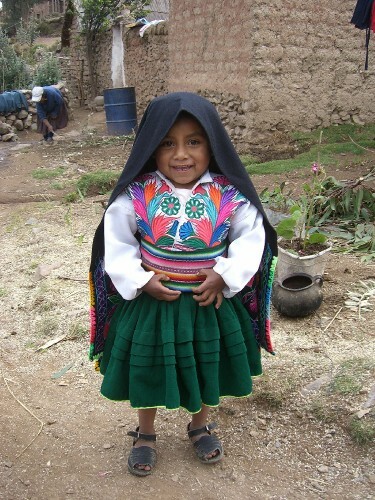 Taquile Island was a good 3 hour boat ride into the lake and the locals still follow a very traditional lifestyle. Most of the older people do not speak Spanish and the local Ketcha language is still dominant. They farm on small crofts and are known for their weaving skills using the wool of sheep, lama and alpaca. We had a tour of the island with our guide Huber and learned that the men of Taquilie wear their hats at different angles if they are married, looking for love or are too busy for women. The colour of their hat also determines their standing in the community, although as a communist Island everyone rotates jobs and a new leader is appointed every Sunday. After visiting the local weaving market in the main square we enjoyed a fine lunch of soup and fresh trout from the lake at one of the local restaurants. From Taquilie we were back on the boat for an hour to the island of Amantani, where we would meet our new Mama for the evening and spend the night. Our Mama was Delma who selected us at the port on our arrival before marching us up the steep hill to her family's house, and ours for the night, high up on the Island. The family consisted of Delma, her three sisters, mum and dad and one of the sisters had a husband and two young girls. The entire family lived together in one house with their small flock of sheep in the back yard, next to the outside toilet. The men of the house were out at work when we arrived but we were greeted with big smiles and then lots of hugs and kisses when we presented the gifts we had purchased the night before.Rosa, one of the two young girls, was a little character and we spent some time helping her colour in using her new toys. It was amazing to see the happiness some paper and a few colouring pencils could bring. As a treat Rosa dressed up in her traditional outfit for us and we took some photos. There were several people like us on tours and on the island for a home stay that night. We all gathered at the local community centre and football pitch for a few hours and we were challenged to locals versus gringos football match.I got involved in the football but at over 3,900m above sea level the lungs were on fire after a few minutes, a problem the locals did not seem to encounter. There were two gringo teams and one local team of 6. On first against the locals we struggled but scrapped through to a 2-1 victory thanks to a couple of Love goals (left foots still working even though the lungs aren't). This however only seemed to anger the locals and we were well beaten in the return fixture, much to their amusement. After football we headed back to the house for dinner. Sitting at a table in the corner of the one main communal room which also housed the clay stove a few chairs and candle lights (no electricity) we were served a meal of soup followed by rice and vegetables and coca tea.It was a very strange experience. The family just sat and talked away all laughing and joking with one another stopping only to ask us a few questions about our trip using the little Spanish we could muster. After dinner we were dressed by in the local traditional outfits and taken back to the community centre by the second youngest sister Flora for an evening of dancing. The dancing was a little like celidh and took a little getting used to but good night had by all.We returned to the house and slept well before being awoken to Rosa asking if we needed the bano and served pancakes for breakfast. We said goodbye to our family and left the Amantani island, it was a very humbling but enjoyable experience. On the way back to Puno we stopped at the Uros Islands. These are floating islands made of reeds.The Uros people have lived like this for hundreds of years and make their islands, houses and boats from the reeds which they also eat. We were again dressed up in local costume and treated to a boat tour on the reed boat not before being shown the local weaving produce that we could buy. This seems to be very common already in Peru. As we set sail on the reed boat the locals sang row, row, row your boat in English, highly amusing. Once back in Puno we had some dinner before an early night.The next morning we are on the bus to Cusco.